That was my astonished reaction to Mohamed the chef, who was calmly preparing the backyard grill for tonight’s dinner, which would be grilled jackfish. He had assembled a small pile of dried halved coconut shells on the grill and was dousing them with lighter fluid. Sure enough, he proceeded to light the fire and grill the fish over the flames that shot up from the coconut shells. As a lover of anything related to coconuts, I was enthralled. As versatile as the coconut is, I had no idea the shells could be used for fire. Brilliant and resourceful, considering the Maldives have an abundant supply of coconuts but limited wood or charcoal. I don’t know if it was because of the fish itself or because of the coconut fire, but that fish, which was simply basted in olive oil, lemon and salt, was phenomenal. Fall-off-your-fork tender and a flavor that’s hard to describe: mildly smoky and exceptionally delicious. This was one of several unique discoveries I made during my 10 day stay in the Maldives: a nation of islands, home to some of the clearest waters, most jaw-dropping tropical beauty and most outrageously luxurious resorts on earth, at risk of vanishing beneath the sea within the next 100 years or so due to rising ocean levels. Of the 1200 islands that make up the Maldives, 200 are local islands, about 100 are resort islands and the rest are uninhabited. As per the government policy of “One Island, One Resort,” each resort controls its own island. They are decadent, luxurious and correspondingly pricy, as you might expect. The local islands, where hotels, guest houses and Airbnb’s have been popping up in recent years, are much more affordable but they are subject to local restrictions, including no alcohol and a suggested dress code in most public areas. So, if you're looking for a tropical liver detox destination, local Maldivian islands could be a great option! Some of the most surprising prices are the costs of transportation to and from the resort islands, which reach as high as $400 per person one way for a half hour sea plane ride. I thought making friends with a boat-owning local and bumming a ride would be a great way to get around this, but it turns out this wouldn’t have worked: the resorts only allow their approved vessels to dock on their islands. So be sure to factor in transportation costs if you’re budgeting for a trip here. 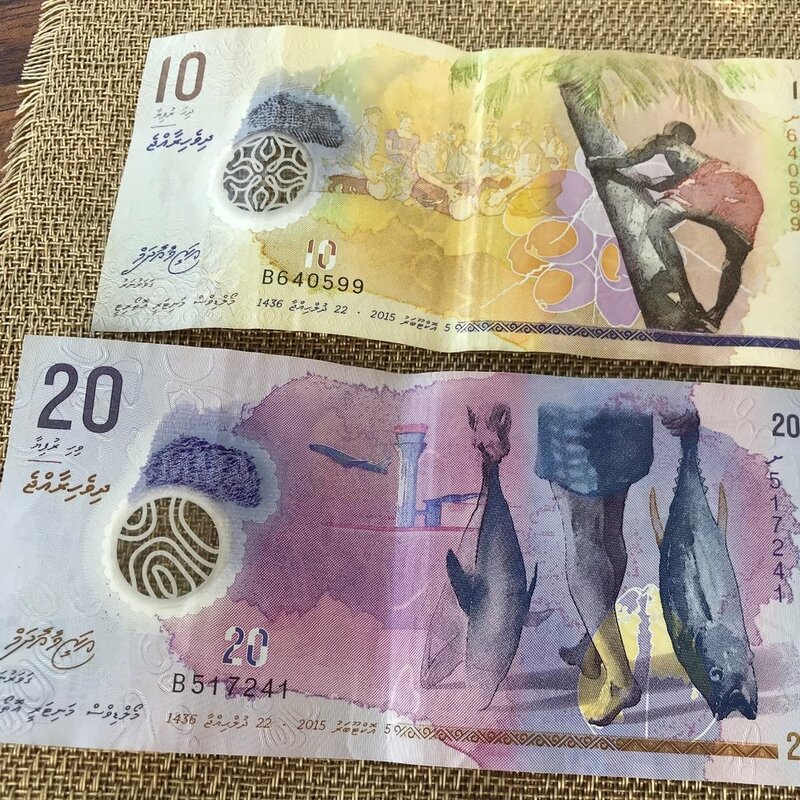 In my case, lovely Daniela of Maison Tiare came to greet me at the Thulusdhoo port and the public taxi (I think there might be only one on the island – a pickup truck with benches in the open back) – took us and my luggage the few blocks to the house. There I discovered and immediately fell in love with one of the best features of the Maldivian lifestyle: the blended indoor/outdoor living. The front door leads you into a lovely garden of coconut trees and desert roses with a sand floor that stretches all the way into the dining area. The living area has a tiled floor but it’s also open. You’re both indoors and outdoors at the same time. The bedrooms of course are enclosed, and air-conditioned (thank goodness, because it’s hot here!) It was here, after the sun went down, that Mohamed introduced me to the coconut shell grilled fish. Daniela being Italian, the fish was naturally served with pasta on the side (and veggies), all consumed in the fresh evening air under the stars. I have to say a glass of red wine would have made this an absolutely perfect meal, but even without, it was seductively magical. By day, in or on the water is where you want to be. Or maybe right next to the water in a hammock. There are sand bars to lounge on, neighboring deserted islands to visit, and snorkeling and diving galore. The water is the breathtakingly transparent turquoise you see in all photos of the Maldives. I expected that; what I didn’t expect was all the dolphins who play in these waters. I saw them every day – by the beach, alongside the boat, on the way to the sandbar. Sometimes there were as many as twenty of them – they swam and jumped and put on an acrobatic show for us, adding extra joy and magic to the day. If we were rating beach destinations based on sand, I have to admit the Maldives wouldn’t take home any trophies. At least not based on the islands I visited. It’s a pretty color, but it’s mostly the rough sand of crushed coral, not the soft, foot-caressing sand of Florida and the Caribbean. It does brush off your skin easily though and I imagine it’s very exfoliating. Although the water is exceptionally still at most of the beaches, both Thulusdhoo and nearby Hudhuranfushi have world class surf breaks – Chickens and Lohis respectively. You'll find Coke’s Surf Camp on Thulusdhoo, where you can sign up for single lessons, although I didn’t get the chance thanks to too many rainy days during my stay. (Yes – even in this paradise, it does occasionally rain.) And good thing it does, because each island is responsible for providing its own desalinated water for drinking and household use. Thulusdhoo is lucky in this respect because the Coca Cola plant is located here, so they provide treated water for the whole island. (They also make Coca Cola using desalinated sea water; the only Coke factory in the world to do so.) You notice the difference in the water when you’re in the shower - because the water is completely absent of minerals, it leaves your skin feeling different – it’s an unusual feeling, a little rubbery. Some other local islands rely exclusively on rainwater, which they collect in large barrels, so if there’s not enough rain, they’re in trouble. A few years ago the desalination plant in the densely inhabited capital of Male was rendered inoperational by a fire, leading to a brief period of chaos. There are only a handful of restaurants on Thulusdhoo, happily including the delightful Contagious Pizza, where Tuesday through Saturday evenings delicious pizzas and salads, flavored ice teas and tantalizing desserts are served in a well-designed open air setting. 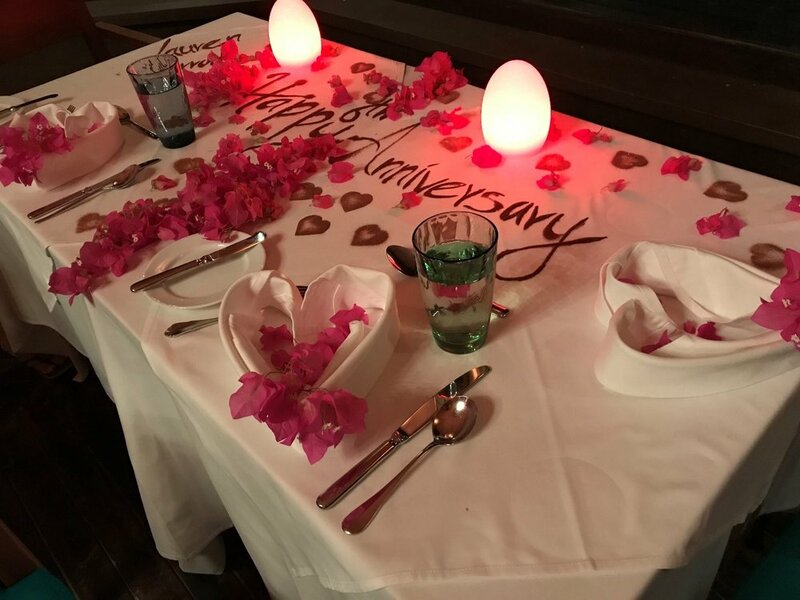 The day we arrived happened to be Lauren and Jarrod’s 6th wedding anniversary – I didn’t know that, but the staff did, and they surprised them that night with a dinner table extravagantly decorated with bright bougainvillea petals, messages painted with melted chocolate, napkins shaped into hearts and a personalized chocolate cake. An unexpected gesture of caring and sweetness that made Lauren cry. Humans can be so beautiful sometimes. I returned to Thulusdhoo for a couple more days to stay at a little piece of heaven I had discovered while walking around the island: Samura Maldives. Designed by Italians with furniture and décor imported from Bali, hammocks and beds swaying peacefully from palm trees next to the water, tables on the sand and an open air covered dining room, it looks like something out of a dream. Its warm and charismatic owner Giacomo gives guests a warm welcome and they operate family-style; all guests have dinner together at big communal tables on the beach under stars and palm trees if the weather is good, and under cover of the roof if it’s raining. Since I was the only non-Italian here, it was like having dinner with a large Italian family every night. With hand gestures, a little Spanish, some invented words and occasionally Google translate we managed to have some limited conversation interspersed with a lot of laughter at our broken attempts at communication.